Worksheet on Clauses of Purpose: to, in order to, so as to, so that. Includes brief explanation and exercises. The key is included. 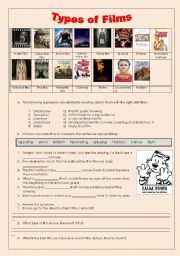 This ws includes types of films, adjectives and expressions related to cinema and to film watching. The text is about TV, it includes comprehension exercises, vocab and grammar exercises (much and many, how questions, present perfect simple and continuous). 9th grade assessment test. 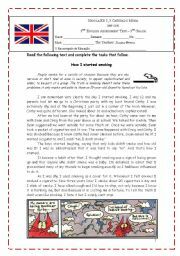 Includes reading comp exercises on a text about smoking, grammar (past perfect∼ple past and reflexive pronouns), vocabulary exercises on addictions and a writing activity. Hope you like it! 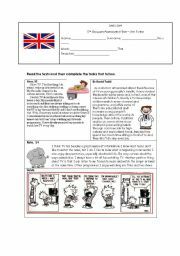 Reading comprehension tasks include True or False, answering questions, matching for synonyms; vocabulary on sports, adjective + preposition, simple past, present simple and continuous. 9th grade assessment test. Includes T/F, answering questions, vocab exercises on the topic. 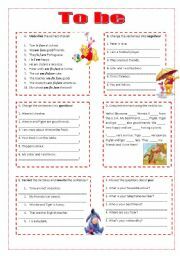 Worksheet on the verb to be: 6 different exercises - choosing the write form, gap-filling, correcting mistakes, writing negatives and questions, answering personal questions. 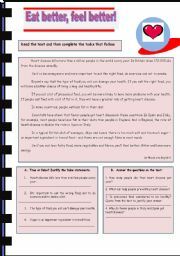 Reading Comprehension Worksheet on Healthy Eating, includes True or False and answering questions. The template is from Mena, thank you dear Mena! Reading comprehension test on hobbies. Garfield tells about his daily routine and asks "and you? ", so that students talk about their daily routine too. This pps contains explanation, usage and exercises on the Past Continuous. First, Criastiano Ronaldo, Lu�s Figo, Angelina Jolie and Shakira introduce themselves in English. Secondly, there�s a dialogue to enlighten how to introduce people. Finally, students are asked some questions to answer orally.